Why Preserve Stem Cells? Learn More! How much does it cost? Find out now! Equi-Stem LLC dedicates itself to being the leading equine stem cell preservation company in the world, offering the highest quality services in the collection of stem cells derived from equine umbilical cord tissue. We accomplish this by employing preeminent experts dedicated to world-class service and by using state-of-the-art equipment. As a result, Equi-Stem is able to provide our customers with timely assistance upon their request of the equine stem cells, in support of current and future discoveries of cellular therapy and regenerative medicine. In addition, through partnering with the most prominent breeders in the world, Equi-Stem enhances the horse’s value today, while preserving the future health and maintenance of the equine athlete for the long-term benefit of current and future owners and trainers! Stem cells can heal the body, promote recovery, and offer an enormous amount of therapeutic potential. Methods used to restore the function of damaged tissue is known as regenerative medicine. Stem cells are the equine body’s “master cells”. They have the ability to self-replicate and differentiate into different cell types that make up the body. Stem cells also serve as an internal repair system, dividing and differentiating to replace damaged or dead tissue. 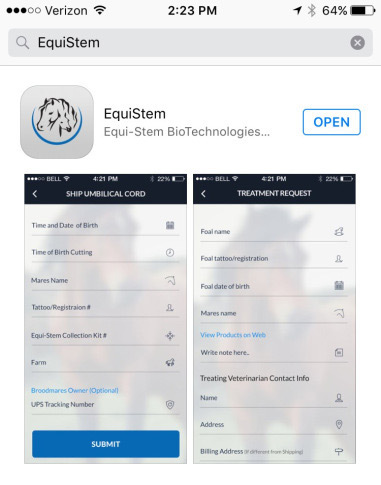 Equi-Stem’s intention is to use the horse’s own MSCs collected from the umbilical cord. This will promote healing by regenerating tissue to re-populate specific cells and tissue after trauma and to bring injured tissue back to its original condition without scar tissue. Because primitive MSCs can transform into a variety of cell types, and due to their proven methods of expansion, they create a potentially unlimited supply of cells. These new cells can then be used to treat some of the most common early career-ending equine injuries involving nerve, muscle, ligament, cartilage, bone, and tendons. Read more about why equine stem cell preservation is important.